I received my Fall Year of Lace shipment. It’s the Silver Birches Shawl designed by Amy Swenson. 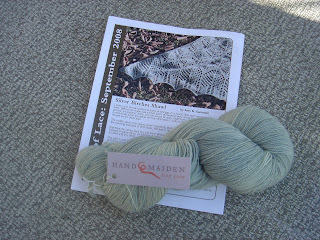 The yarn is a scrumptious cashmere 2-ply by Handmaiden in a pale silvery-green. I am resisting casting on until I have completed the summer shawl, which currently lies slumbering. 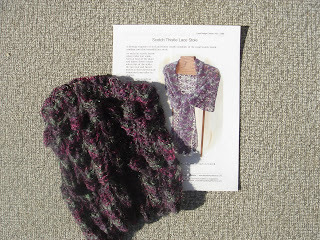 I started the Scotch Thistle Lace Stole with some Cherry Tree Hill Glitter Alpaca I bought last winter. I knew I wanted to make a rectangular shawl with this yarn but just hadn’t found the right pattern for it. I think I was drawn to this design because the colours of the original yarn were similar to my own and I could visualize how it would look made up. The pattern is quite simple and is knitting up quickly. 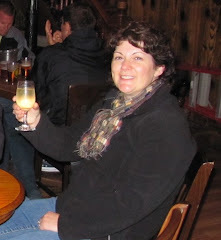 I have plans to wear the shawl to my husband’s company Christmas party. I’ve cast on some more socks. 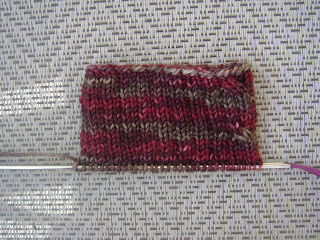 I am making the Cable Rib Socks from Favourite Socks, using Malabrigo sock weight in the Stonechat colourway. I love this colour so much I have ordered some worsted weight for a sweater. 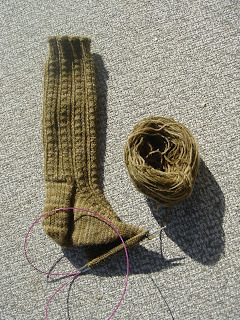 I am also knitting another pair from Favourite Socks, the Retro Rib Socks. These are for my brother-in-law’s birthday in November. I am using some khaki-coloured Araucania Ranco, which you may recognize as the recycled yarn from my ex-son-in-law’s partially-knit pair. Don’t worry, I am knitting some seriously good mojo into them for Ed. If you are looking for a pattern for men's socks, I highly recommend this one. 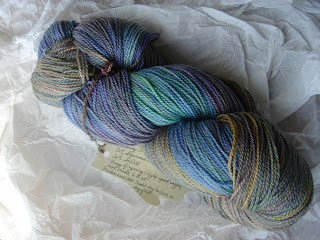 Lately there have been a few yarn-filled parcels arriving at my door. While I won’t reveal everything I’ve received on the grounds that I may incriminate myself, I will show you a couple of my favourites. I couldn’t resist this merino-seacell blend called The Sea of Cortez from StashUpYarns. This photo doesn't even begin to do it justice. I plan to knit it into this shawl. 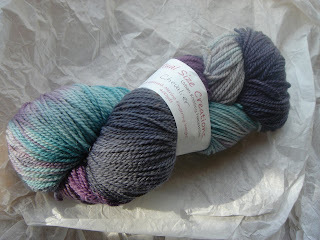 And this sock yarn from Actual Size Creations is called Chevalier, which just so happens to be my maiden name. Tell, me, how could I not buy it when it literally called my name? 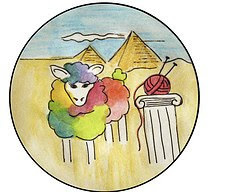 Meanwhile, I have been knitting more squares for the Great American Afghan and hope to have an update later this week.